God alone is our source for eternal hope, life, and salvation. True joy and peace come from God. We often try to find joy and peace through worldly things that fade away. Receive a small gift, and your joy might be minimal. Receive a large gift, and your joyous reaction is greater. I just gave one of my daughters a cute note pad, and she had a big smile on her face and squeeled, “Thank you mommy!”. I gave my other daughter a car (very used) and she squealed, jumped up and down, cried and thanked me a million times. Receive a small gift, and your joy might be minimal. Receive a large gift, and your joyous reaction is greater. When I think on the grace, mercy, love, hope, joy, life, gifts and salvation God has given me I jump up and down too! My rejoicing is great and I start Jesus-jigging! When Christ followers don’t have much joy in their lives, something is wrong. Spend time thinking on the things God has given you–rescued you from–brought you to–brought you through. We’ve all been through some “stuff” and God has brought us through them. Just as when the disciples gathered up the remnants from the miracle of Jesus feeding the 5,000 into the storm, take those blessings from your past into your right now and into your future. 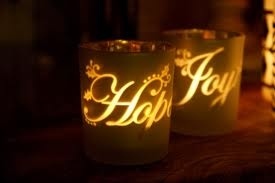 True Christmas joy comes from rejoicing over the great big~bigger than life~gifts of grace. Christmas isn’t a time or season, it’s a year round state of mind….a condition of the heart.